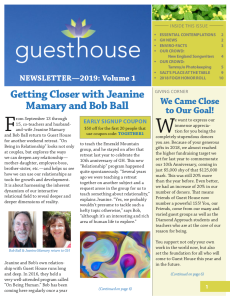 “From September 13 through 15, co-teachers and husband-and-wife Jeanine Mamary and Bob Ball return to Guest House for another weekend retreat. “On Being in Relationship” looks not only at couples, but explores the ways we can deepen any relationship—mother-daughter, employee-boss, brother-sister, etc.—and helps us see how we can use our relationships as tools for growth and development. It is about harnessing the inherent dynamism of our interactive relational field to reveal deeper and deeper dimensions of reality.